The Duke and Duchess of Cambridge and their two children are in Warsaw at the start of their visit to Poland and Germany. 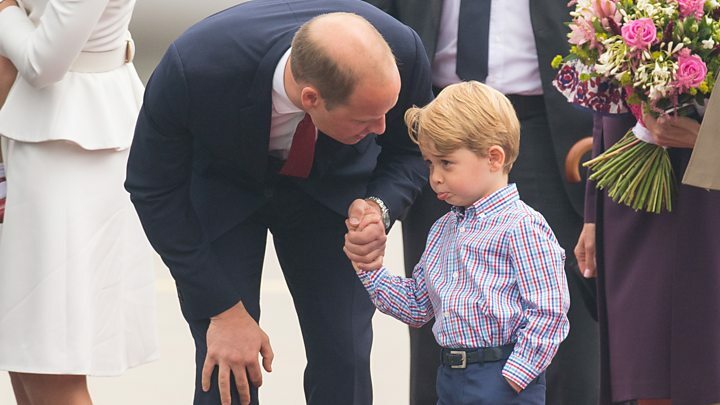 Kensington Palace said Prince George, three, and Princess Charlotte, two, would be seen "on at least a couple of occasions over the course of the week". "The duke and duchess are very much looking forward to this tour and are delighted with the exciting and varied programme that has been put together for it," a Kensington Palace spokesman said. They were greeted at Warsaw Chopin Airport by the UK's ambassador to Poland, Jonathan Knott, and his wife, alongside Poland's ambassador to Britain, Arkady Rzegocki. Prince George and Princess Charlotte were last seen in public on the balcony of Buckingham Palace for a flypast following the Trooping the Colour ceremony for the Queen's birthday last month. For their parents, the visit to Poland and Germany will inevitably be viewed in the context of Brexit. The royal couple and their children were welcomed in Warsaw at a meeting with President Andrzej Duda. Prince William and the duchess joined the president and the first lady to greet well wishers around the presidential palace. Student Magda Mordaka, 21, said: "We were telling [the duchess] that she is beautiful and perfect, but she said it's not true - it's just the make-up." The Polish ambassador to the UK presented the royal couple with three books to give to George and Charlotte. They were Mr Miniscule and the Whale, Bees: A Honeyed History, and Maps. Prince William and Catherine visited the Warsaw Rising Museum, dedicated to the 1944 Polish uprising to liberate Warsaw from German occupation during World War Two. Some 200,000 Polish people died during 63 days of fighting. Prince William and Catherine paid their respects to the fallen soldiers of the uprising when they visited a wall of remembrance. The names of 34 British servicemen, who died trying to give supplies to the Polish soldiers, were also listed on the wall. Later, William spoke at an evening garden party to celebrate the Queen's birthday, telling guests in Polish: "Good evening, we hope you have a nice party." He also also hailed Poland's "courage, fortitude and bravery" in surviving centuries of assaults, particularly its "incredible bravery" during the Nazi occupation. He read a message from the Queen detailing 1,000 years of ties between the UK and Poland. Catherine wore a sleeveless white dress by Polish designer Gosia Baczynska for the occasion. In Germany later this week, Chancellor Angela Merkel will hold a private meeting with the royal couple in Berlin before they visit the Brandenburg Gate, a symbol of German unification. The duke and duchess will also visit Berlin's Holocaust museum and memorial. William and Catherine will cox opposing rowing teams in the race with crews from Cambridge and Heidelberg.